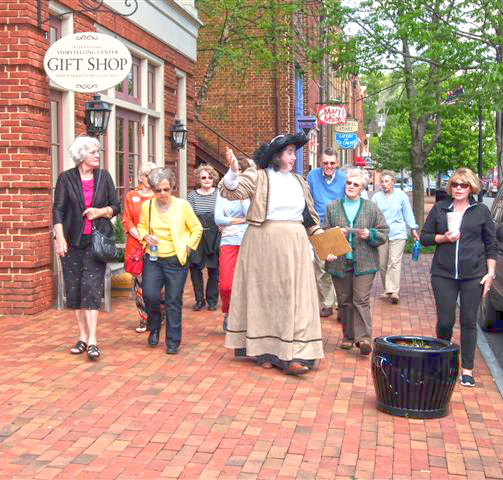 Jonesborough’s Historic Walking Tours will resume on Friday, March 4 at 1 p.m., and there are some exciting changes coming this season. Implemented in the fall of 2014 by the Heritage Alliance of Northeast Tennessee and Southwest Virginia and Main Street Jonesborough, these tours have shared Jonesborough’s rich history and heritage with more than 1,000 people thus far. This season, guests can purchase their tickets, still only $5 per person, directly at the Chester Inn State Historic Site and Museum located on Main Street in downtown Jonesborough. Tours will depart from the Museum and costumed guides will lead guests on an hour long journey through Jonesborough’s storied past. 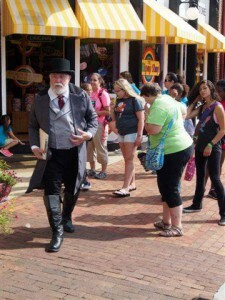 Historic Walking Tours will be available Monday, Friday and Saturday from March through April. The schedule will change to include Wednesday beginning the first of May and run through the end of October. All tours start at 1 p.m. and last approximately an hour to accommodate guests partaking in the International Storytelling Center’s Teller in Residence program that begins at 2 p.m.
For more information on Jonesborough’s Historic Walking Tours, please contact the Chester Inn Museum at 423.753.4580. To schedule a tour for a larger group, or another day/time, please contact the Heritage Alliance directly at 423.753.9580. Not Your Ordinary Dinner Party – Exciting New Event! The Heritage Alliance of Northeast Tennessee and Southwest Virginia presents an outdoor drama theatre on June 11 at 6:30 p.m. outside the historic Old Jonesborough Cemetery and Carriage House Bed & Breakfast located on East Main Street in Jonesborough. A fundraiser for the region-wide preservation organization, “Not Your Ordinary Dinner Party” will consist of Washington County Commissioner Joe Grandy’s much talked about bar-b-que as the main course, complimented with southern sides and a savory dessert as guests are treated to a production created specifically for the evening by local playwright Anne Mason. The production is entitled “With These Hands” and will only be available for public audiences during the Not Your Ordinary Dinner Party fundraiser hosted by the Heritage Alliance. 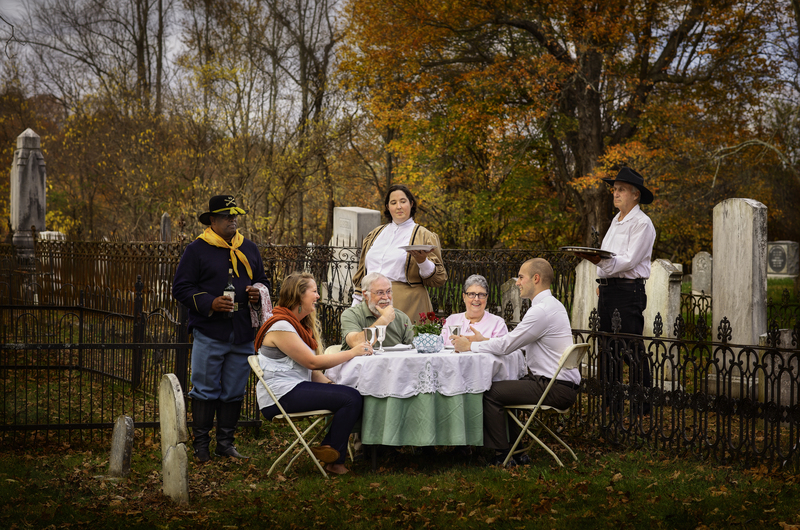 Mason describes the three act production as a “dramedy” that takes a look into the lives of several Washington County residents that are buried in some of the oldest cemeteries in the area. Stories will be portrayed by local actors in period style clothing. The stories will include tales of folks buried in Maple Lawn, Rocky Hill and College Hill Cemeteries. Not Your Ordinary Dinner Party is a fundraising effort to benefit the preservation and heritage education work of the Heritage Alliance, a not-for-profit organization whose region-wide work includes the award winning Oak Hill School Heritage Education program, the Chester Inn State Historic Site and the Jonesborough Washington County History Museum and Archives. The event will take place on June 11 at 6:30 p.m. Tickets are offered at a pre-sale discount of $80 through April 16. Beginning April 17, tickets are $85 per person and will be offered on a first-come-first serve basis. To purchase tickets, visit jonesboroughtn.org or call 423-753-1010. The Chester Inn Museum will be open for Jonesborough’s first annual Chocolate Fest on Saturday, February 13 from 11:00-6:00. We’ll have chocolatey goodness for festival ticket holders. We’ll also have a Town Tour at 1:00. Tickets for the tour are $5.00 and can be purchased at the Chester Inn Museum. Tickets for the Chocolate Fest are available online until 5:00 pm on Tuesday, February 9. After that, they’ll be available at the International Storytelling Center. Follow this link (http://www.jonesboroughtn.org/index.php/component/k2/154-jamsa-chocolate-fest) for tickets.